Located in the Bay of Plenty forestry heartland, it shouldn’t be a surprise that forestry is a popular subject for Year 12 and 13 students at Rotorua Boys High School. It is unusual, however, because very few schools in New Zealand offer forestry as a NCEA subject. The course is taught by Deputy Principal Roy Roe, and the students achieve Level 2 and 3 Unit Standards, which double as NCEA credits. Roy has worked in the forest industry himself, and has good contacts both with some of the local forest management companies and with Toi Ohomai (ex. Waiariki Institute of Technology). 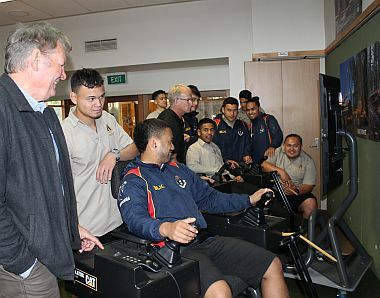 The RBHS students visit Toi Ohomai regularly. Roy works closely with tutor Richard Stringfellow, and one of the attractions is the opportunity to do some hands-on training on the state-or-the-art grapple and harvesting simulators which Toi Ohomai have invested in as part of their forestry teaching resources. “Visits to Toi Ohomai, and field trips to see operations, are important in the learning and assessment of the Unit Standards we cover - they are the part of the course the students enjoy the most, and get the most out of. Toi Ohomai tutors have always been most generous in providing expertise, encouragement and professional development. There are a healthy number of ex-Rotorua Boys High School students now working in contracting and forest management around New Zealand. Toi Ohomai works closely with the forest industry throughout New Zealand to deliver courses ranging from entry level operational skills to the Diploma in Forest Management (Level 6).